The Reset, Soft Reset, and NMI exceptions are always vectored to location 0xBFC00000 (uncached, start-up safe KSEG1 region). Addresses for all other exceptions are a combination of a vector base address and a vector offset. In MIPS32® Release 2 and higher architectures, software is allowed to specify the vector base address via the CP0 Ebase register for exceptions that occur when CP0 StatusBEV equals 0. MIPS32® architectures provide a "bootstrap" mode (referred to as Boot-Exception Vector (BEV) mode) whereby exception entry points are reallocated into the uncached, start-up-safe KSEG1 region. Note: StatusBEV = 1 at reset. If Ebase is to be changed, it must be done with StatusBEV = 1 (i.e. at system boot). 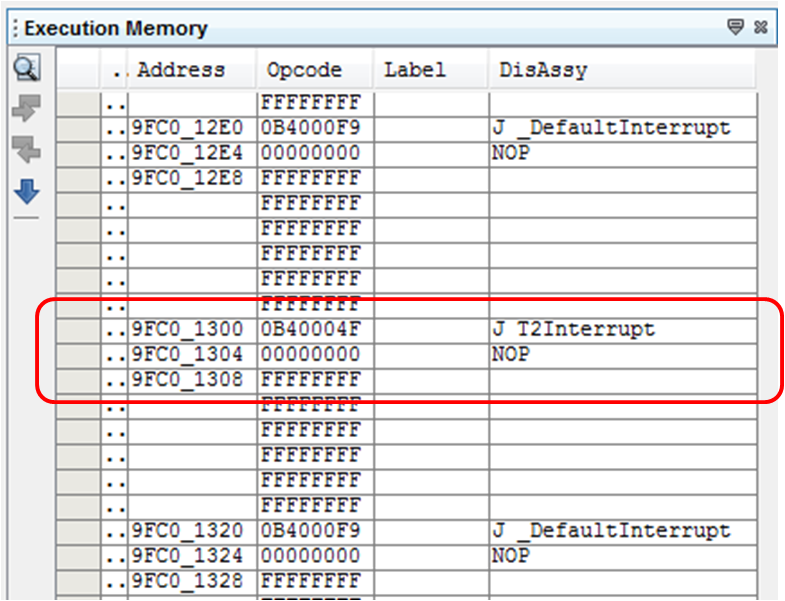 The operation of the CPU is UNDEFINED if Ebase is written when StatusBEV = 0. Setting the CP0 CauseIV bit to 1 causes Interrupt exceptions to use a dedicated exception vector offset (0x200), rather than having to use the general exception vector offset (0x180). MPLAB® XC32 start-up code initializes CauseIV to 1. These bits specify the spacing between each interrupt vector for CPUs supporting Computed Interrupt Vector Offsets (PIC32MX). MPLAB® XC32 start-up code initializes IntCtlVS to 0x01, which encodes a spacing of 32 bytes (8 words) between interrupt exception vectors. For an illustration, see the Timer 2 Interrupt Vector Address calculation example below. Note: StatusEXL must be cleared by the exception handler in order to re-enable interrupts. MIPS® CPUs have an instruction, eret, that both clears StatusEXL and returns control to the address stored in EPC. 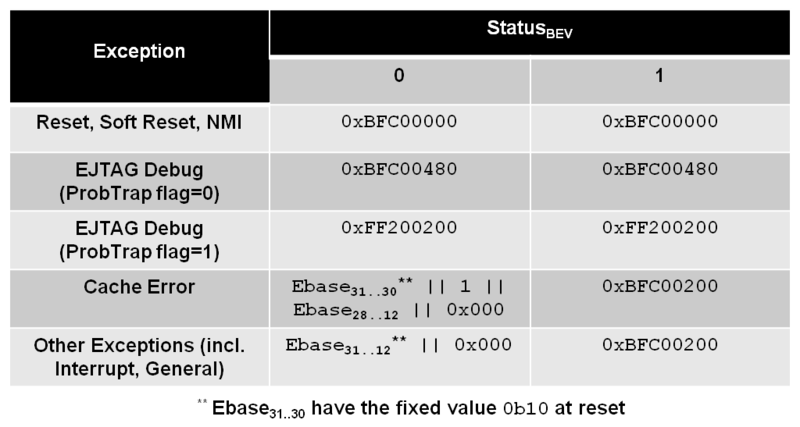 The MPLAB® XC32 Compiler calculates & initializes the vector address for each defined application interrupt service routine (see Table 7.1 in the PIC32MX data sheet for a listing of vector numbers assigned to each interrupt source). An interrupt handler function can be associated with an interrupt vector either as the target of a dispatch function located at the exception vector address (as shown in the above example), or as being located directly at the exception vector address. Handler functions that are linked directly to the vector will be executed faster. Although the vector spacing can be adjusted, there is limited space between vectors and linking a substantial handler function directly at a vector may cause it to overlap the higher vector locations, preventing their use. In such situations, using a dispatch function is a safer option. MPLAB® XC32 start-up code initializes IntCtlVS to the value defined by the symbol _vector_spacing in the PIC32MX device linker script (for PIC32MX795F512L, _vector_spacing = 0x00000001, which corresponds to the spacing of 32 bytes or 8 words), however, by using function attributes, a handler can be located directly at the vector address. See the MPLAB® XC32 User's Manual for details.